Many families are faced with the problem of caring for aging relatives that can no longer live alone at home. Out of home care can offer many benefits to both the elder and his or her family members. They can provide around the clock care for seniors with memory problems or disabilities that make it unsafe to live independently. 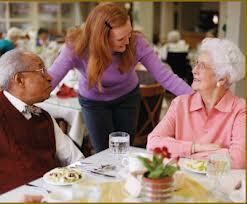 Who Needs Out of Home Senior CareIn past times, it was common to have elderly parents live with their grown children. However, modern society has changed significantly, and this may no longer be a viable solution for an aging parent. Grown children may be divorced and live in much smaller living quarters. Both husbands and wives may work full time and not be available to provide care for the senior for long periods of time during the day. Families are smaller now as well so that other children may not be available to help out with care. Though many seniors are choosing to “age in place” in their own homes with some help from children or home health caregivers, this may not be the right solution for every senior. Aging people with severe memory problems or those with medical conditions that require constant monitoring may need the constant care that an out of home facility can provide. 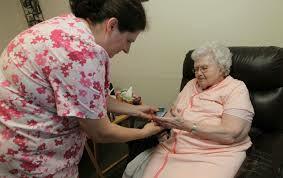 Assisted LivingAssisted living has grown in popularity over the past decades. According to the Small Business Development Center, up to one million Americans live in senior care facilities, and many choose the assisted living option because of its many advantages. These facilities provide cleaning, laundry and meals in a residential environment that often includes a variety of enriching activities to keep bodies healthy and minds sharp. Assisted living facilities provide a good solution for seniors who do not have serious medical conditions, are able to get around on their own and enjoy interacting with other people of their own age. Group HomesIn some areas of the United States, group homes provide care for seniors in a home environment with caregivers that the elder has a consistent relationship. These can often be a good substitute for the family environment and can provide the senior with interaction with other people his age, as well as 24/7 supervision. Nursing HomesFor elders with severe medical problems that need 24/7 nursing care, the nursing home can offer skilled, experienced clinical care. Ways To Stay InvolvedFrequent visits to the care home are the best way to stay in touch with an elder who is an out of home facility. If possible, you can take the elder for visits to local stores, museums, restaurants and movie theaters for an outing that will brighten their day and provide mental stimulation. Simple conversation is often the best way to connect them with events in the day and general family events. Of course, involving them in family parties, holiday occasions can help to keep the elder in the family circle. Bringing books, puzzles, photographs of other family members and mementos of happy times together can also provide positive interactions with them. Frequent phone calls are another way to check in on them on a daily basis.